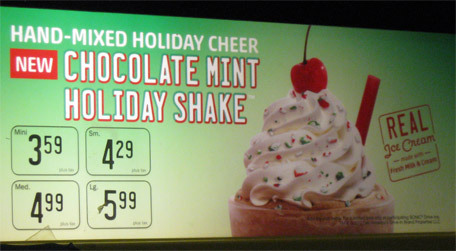 It's their Hand-mixed Holiday Cheer in the form of the brand new Chocolate Mint Holiday Shake (made with real ice cream ofcourse). 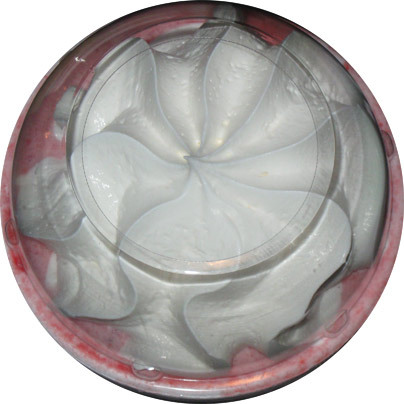 They sent me a $20 gift to go try it out, and one lucky commenter can get themselves a $20 gift card as well (just make sure you leave your email address so I can find you). 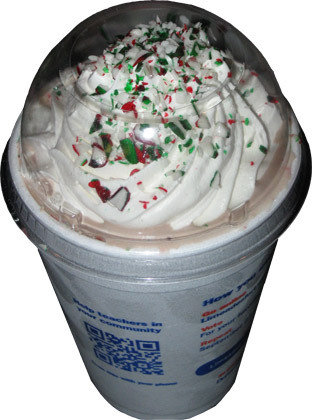 If you do make it to sonic (with or without the gift card), I do recommend trying the new shake. There are probably two key features here. One, notice the chocolate milkshake base. Chocolate is the primary flavor here, I didn't pick up any kind of mint sauce blended in. Two, the candy cane bits aren't just the pretty topping. No no, they've blended some of the bits into the shake. It's funky because you can drink this like a normal shake and not really notice the bits OR take your time and enjoy the tiny crunches throughout your treat. It's a win win for a shake that is thicker than your standard fast food shake, yet still thin enough that you don't have to fight with it. Ok, now you didn't think I pack up the kids, the wife, the iTablets and headed all the way out to Sonic just for a milkshake did you? Ofcourse not. That shake was merely my dessert for the ride home. You see, when we go to Sonic, we go all out. I'm taking all my gift cards, texting my buddy to meet us, and we're making a Sunday night adventure out of this. So what did we get? Well, I couldn't resist the chance to try the new Asiago Grilled Chicken sandwich. It was a fine sandwich, though I dig make a mess of myself. I guess I still haven't mastered the soft breads of Sonic Sandwiches. They wrap them in foil pouches, so they kind of self steam and soften up. No one else really does that around here. I also tried the onion rings. They were fresh, simple, and I wished I had remembered to ask for ketchup to dip them in. For my drink, I tried a Sonic Creamslush which is half ice cream, half slush, and completely hard to drink.... Sorry, I guess I was expecting my long lost Burger King ICEE but instead I got a very natural taste that was in desperate need of a bigger straw. Mrs. Dubba actually went with a grilled cheese, tater tots and a tasty chocolate shake. After downing her cheeseburger kid's meal, I got my daughter a mini Oreo blast. Now I don't remember them having a mini size last time, but I'm glad they do now. So he did! 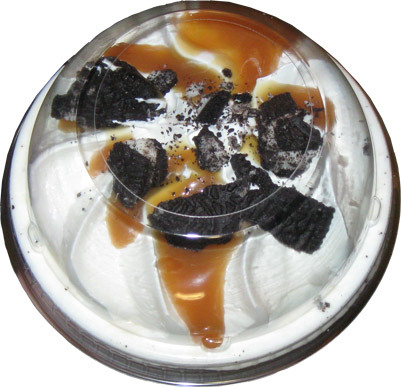 Pretty sure the caramel went all the way through. Our last tip comes from my buddy's wife. She says you have to try a coke and the added shot of cherry flavor. It's like my beloved cherry coke, but even better and I am so trying that next time. Wait, should I mention the kid's meal toy before I go? I thought we were going to get some cuddly tots but technically this was our prize. It was unexpected, but in Sonic's defense, my young son did still get a big kick out of his cards and plays with them a few times a day, so he's still happy and that's what really matters. Ok, thanks for reading the whole story. If you want to be entered to win the $20 gift card, simply enter a comment with your email below. Maybe tell us what you are hoping to get at Sonic... or for Christmas, or whatever, it's all good. I'll pick a winner over the weekend. Tuesday Morning Update: Julien is our winner! Congratulations! Enjoy your gift card! Looks delicious. Need a shake for finals! 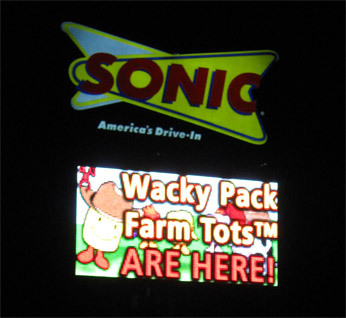 i have only been to sonic once, but would love to try their sweet potato tots and the holiday shake! Great post as always, Dubba. 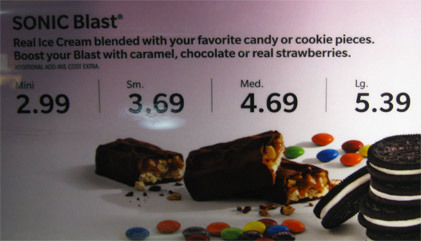 Now, don't you want to send me to Sonic for $20 worth of delicious? I've been wanting to try these new chicken sandwiches, but who am I kidding? If I win, I'm getting a corn dog and tater tots, because there's really no other place to get them. sweet potato tots? I totally forgot about those.... strange, they aren't on the menu right now. HA! I had been tempted to try a corn dog because I've never actually had one before! 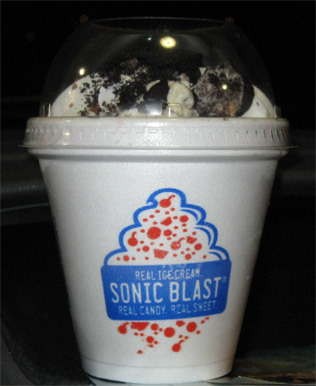 [email hidden] Sonic is one of my favorite places to go to for a shake :) Love the blog, keep it up! hehehe, I would send everyone a GC if I could! hehehe, looking back, I would totally dig have a big icy cold shake on my desk during finals. I absolutely love Sonic's Diet Cherry Limeade! So refreshing! Yum! I am huge cherry limeade fan! And sonic's French Toast sticks are a super-sugary filled breakfast! Doh! My wife talked herself out of getting those. Next time! I am the biggest fan of Sonic. At least their liquid stuff. The limeade and milkshakes--YUM. I'm always so focused on slurping down their drink treats that I have never tried any of their food! See, I need that gift card! I've never been to Sonic before so I'd love to try it! They've opened two near me recently. 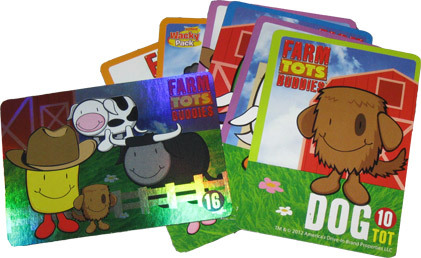 Last time I went, I got the fold-up barn that the tots are supposed to go in. -_-"
I have never eaten at Sonic, so a gift card would get some tots and shakes in my belly. I've never been to a Sonic before. I'd love to try it, since I'm a slave to anything mint-flavored. I would love to get some of their shakes. I love those things! Sonic is one of my go-to lunch stops. Love, love, love their chocolate shakes!